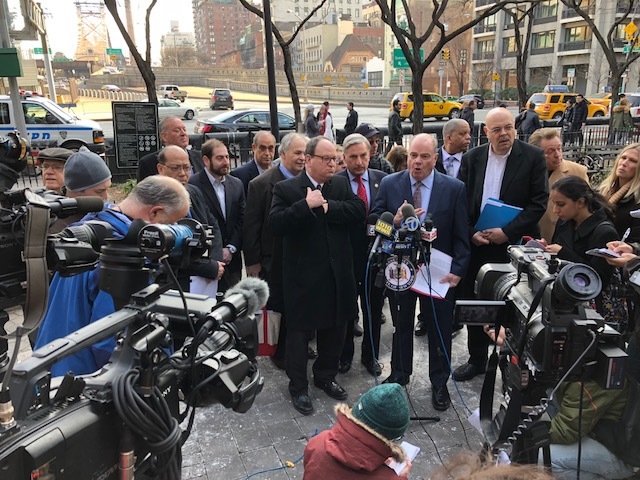 Anytime congestion pricing gains some political momentum, you can count on Eastern Queens Assembly Member David Weprin to stage a press event at the foot of the Queensboro Bridge and proclaim that driving for free into the most car-clogged part of the city is an essential right. Usually, Weprin gets his message across uncontested. But yesterday he had some competition. With Governor Cuomo’s Fix NYC panel recommending a congestion pricing plan worth rallying behind, advocates with the Riders Alliance chanted over Weprin’s press conference, calling on him to get out of the way of a policy to reduce traffic and raise funds for transit. Advocates came ready with the data to back up their message, citing research from the Community Service Society showing that a small share of outer borough residents car commute to the Manhattan CBD, and those that do tend to be well-off — stats that seeped into coverage in AMNY and Politico. The Weprin presser featured ritualistic quotes about Eastern Queens commuters who’d be ravaged by congestion pricing (even though the proposed fee is about equal to subway fare for any car commuters who have a carpooler), and the purported hit that small business owners who run trucks into Manhattan would absorb. The volunteers who showed up for the Riders Alliance weren’t buying it, and they spoke from personal experience. Burke rides the QM16 express bus to work in morning, when the route goes through the tolled Queens Midtown Tunnel to cross the East River. When the bus heads back to the Rockaways in the evening, it goes over the free Queensboro Bridge, and the traffic renders it unusable. “You cannot take it home,” Burke said. “You hit the 59th Street bridge, you will kill yourself.” More than 16,000 people ride buses over the Queensboro each weekday, enduring molasses-like speeds during the p.m. rush. In Queens Plaza, buses poke along at walking speed, according to a 2010 study by DOT [PDF]. Toby Sheppard-Bloch, 41, lives in Glendale and used to run a small interior remodeling business, with two vans and three to four employees. The costs and aggravation of congestion were a major factor in his decision to close shop a few years ago. This is great. Government in action. People listening. Hopefully learning! He speaks for a tiny minority of mostly placard holders. It’s high time people stop listening to this dinosaur. Yay, Riders Alliance! Of course drivers don’t want to pay for the privileges that they are granted for free today, or to recognize the damage they cause to the city! Wish I could have been there too! Bookmark these factsheets from the Tri-State Transportation Campaign to share with your State Senate and Assembly reps.